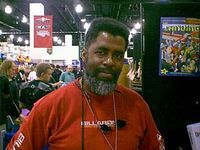 Michael Alyn Pondsmith (born April 14, 1954), typically credited as Mike Pondsmith, is an American roleplaying, board, and video game designer. He is best known for his work for the publisher R. Talsorian Games, where he developed a majority of the company's role-playing game lines since the company's founding in 1982. Pondsmith is credited as an author of several RPG lines, including Mekton (1984), Cyberpunk (1988) and Castle Falkenstein (1994). He also contributed to the Forgotten Realms and Oriental Adventures lines of the Dungeons & Dragons role-playing game, worked in various capacities on video games, and authored or co-created several board games. Pondsmith also worked as an instructor at the DigiPen Institute of Technology. Source: Wikipedia, "Mike Pondsmith", available under the CC-BY-SA License.